Time for a bit of fun instead of all the gloom doom. What if, you had complete and total control of the budget of where the tax dollars go? 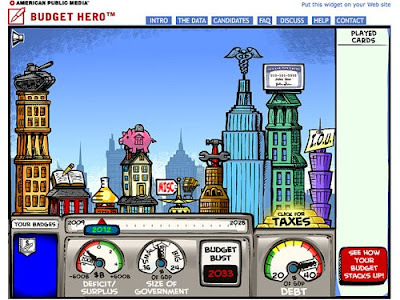 Try "Budget Hero". This lets you chart a course to economic liberation. You can play as either presidential candidate, a treehugging hippie, a hater of defense spending, a big business guy, a medicare moderator, or any number of other outstretched hands in the national budget. See if you can help this failing economy by your own ethics, values and morals. 0 Responses to "Tackling the Budget - The GAME"
So How Did Your Senator Vote? Schooner Tuna, where are you when we need you? Did You Know, We're All Crazy?